Home » Blog » "A natural leader who will hit the ground running"
The following is a message from well-known StateCollege.com columnist Holly Swanson to the Penn State community. We are fortunate this year to have an exceptionally strong group of candidates running for the open seats on the Penn State Board of Trustees. One candidate, however, stands out to me as a natural leader who will hit the ground running if elected—Ryan Bagwell ’02. Ryan has spent the past two years tirelessly fighting the bureaucracy of silence that led Penn State into it’s current situation. While current member of the Board and the leadership of the University remain silent about what they knew about Jerry Sandusky’s crime and why they made the decision to fire Joe Paterno and Graham Spanier, Ryan has dogged them every step of the way. Using the Right to Know law, Ryan has fought successfully to obtain thousands of documents relating to the Freeh investigation of Sandusky. He also forced the Board Trustees to release their conflict of interest disclosure forms, something that many of them did not want to do. 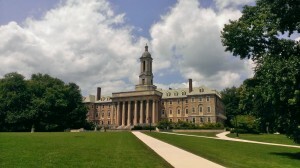 While the Penn State administration talks about transparency, Ryan holds them to it. Many of the steps the Board has taken to be more transparent can be traced back to Ryan’s diligence and his determination to make all pertinent information available. Ryan, however, isn’t just interested in the Board. He wants to help more families being able to afford a Penn State education, by freezing tuition during an undergraduates schooling and lowering the student loan rate. On a personal note, although I am a long-time community member and have been vocal in supporting Penn State, I am not an alum and I don’t get a vote. But if I did, it would be for Ryan. As I said earlier, there are many great candidates running for the board. Ryan deserves to be among the three selected. Remember, he will not run again after this election, so this is our last chance to get him where he needs to be—as a strong voice on the Penn State Board of Trustees.